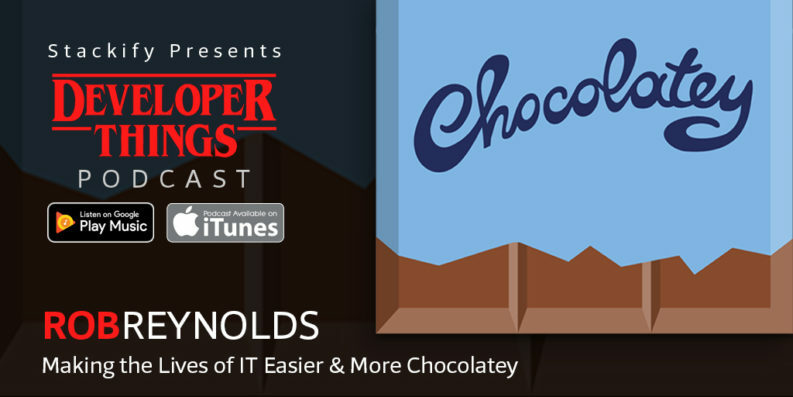 This episode of Developer Things features guest Rob Reynolds. Rob is the founder and CEO of Chocolatey, an open source package manager for Windows. Rob started out as a developer of business apps for organizations, but he was interested in automation and had a dream of owning his own business one day. Eventually, he started working on NuGet, a package manager for .NET. The idea of Chocolatey evolved out of that experience. Chocolatey has been in business for about six years. Rob explains what Chocolatey does and how it’s used. A discussion of how many people are using Chocolatey and what they’re using it for. Some of the most common installs with Chocolatey include Flash player, Google Chrome, Adobe Reader, Java, and Firefox. How the idea of Chocolatey has evolved between the time that it started and now. How Rob used Kickstarter to crowdsource the funds to cover the costs for Chocolatey. The major selling points for Chocolatey. How businesses can purchase Chocolatey for business. What new things are coming for Chocolatey in 2018, including a central management dashboard.